Getting a passport for the first time or applying for a renewal doesn’t have to be a stressful process. After the age of 16, even if you’ve held a child passport, applicants can use Form DS-11 to apply for a ten-year passport book or card. Even before children turn 16, this form can be used up to three times for five-year passports. In addition, DS-11 is acceptable for renewals under special circumstances: when a passport is lost or stolen; when a passport is damaged beyond an acceptable level; when a ten-year passport was issued more than fifteen years ago. Because Form DS-11 is intended for those who have never held a US passport, including children possibly receiving their first form of ID, the paperwork required is considerable. All applicants must provide evidence of US citizenship. For previous passport holders, a passport that was issued over fifteen years ago can be acceptable as proof of your US citizenship, provided it is undamaged. Otherwise, acceptable documents include: US birth certificate that was issued by the city, county, or state of birth and lists your full name, date of birth, and place of birth in addition to your parents’ full names, dated and signed by the registrar and bearing the seal of the issuing authority, known as the long-form birth certificate. If you were born abroad, you must include the Consular Report of Birth Abroad or Certification of Birth, Certificate of Naturalization, or Certificate of Citizenship. All applicants must also provide a copy of whatever document they bring in. State-issued driver’s licenses or expired – but again, undamaged – passports are acceptable as a form of ID. A photocopy should also be provided. Two passport-sized photos should be included with your ID and application. All photographs sent in with your other passport documents must be printed on photo quality paper, measuring 2×2 inches. Children under 16, children aged 16-17, previous passport holders whose documents were lost or stolen, those who owe more than $2500 in child support, those who are requesting a gender designation change, and official, diplomatic, or other special issuance passport holders should provide additional documentation. Those who legally changed their name are advised to have that reflected on their state-issued ID and evidence of US citizenship prior to applying for a US passport, but this can also be done with appropriate documentation. The standard processing fees for a new US passport, which must be included with every application, are $110 ($80 for children) in the form of a check or money order. If you’re applying in person at a regional passport office, an Execution Fee of $25 is added. In addition, there is a $60 fee for any request for expedited service, subject to the workload of the passport office and the officer serving you. If you’re sending in Form DS-11 with all the appropriate paperwork and fees by mail, the processing time can be a matter of weeks. In person at a nearby passport office, days. With an expedited request in person? That varies considerably, but it’s possible to process applications in 1-2 days for emergency travel, e.g. death in the family. Are all the documents for your passport prepared? 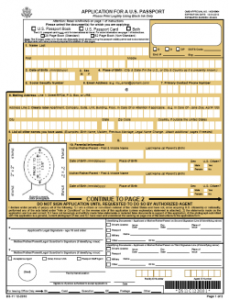 Do you qualify to use Form DS-11 for your passport application? Even if you’re unsure as to the answers to these questions, Travel Visa Pro is standing ready to assist with your visa and passport needs. While the passport application process is designed to accommodate the average traveler’s needs, there are many of our clients who simply have neither the time nor the inclination to leave things up to chance, least of all the only document that will allow them to travel abroad for business or pleasure. If you’re uncertain as to whether you’ve filled out Form DS-11 correctly or included everything required, such gaps can lead to considerable delays in getting you your new passport. Even if you’re confident in your ability to navigate the bureaucracy, leaving the processing time up to chance may not be something you’re prepared to do for an important trip. When that happens, trust in the experts at Travel Visa Pro to get your new passport book for you.